Pumpkin season is in full swing, and this pumpkin sage soup is the perfect first course for any meal. 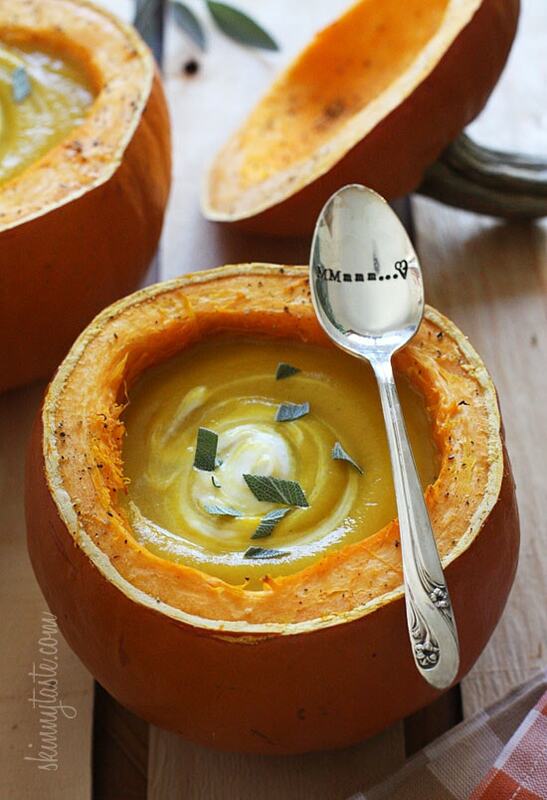 Totally optional, but I love using hollowed out pumpkins as a bowl for a beautiful presentation. The aroma of roasted pumpkins and sage smells like everything I love about Thanksgiving – warmth, comfort, family and friends. If you can’t find sugar or pumpkin pie pumpkins, butternut would work fine it it’s place. This soup can be made ahead and reheated when ready to serve. I went pumpkin picking a few weeks ago and and had so many sugar pumpkins, I knew I was going to use some as bowls. Wouldn’t this be beautiful on your Thanksgiving table! 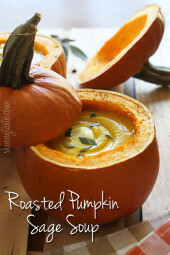 If you want to do this, look for small pumpkins, about 2-1/4 to 2-1/2 lbs, otherwise your bowls will hold too much soup. To make the bowls, I followed this method only I roasted them 15 minutes longer, it will depend on the size of your pumpkin. You can do this a day ahead, then heat in the oven before serving to keep your soup warm. I actually washed mine after using and they still look good. 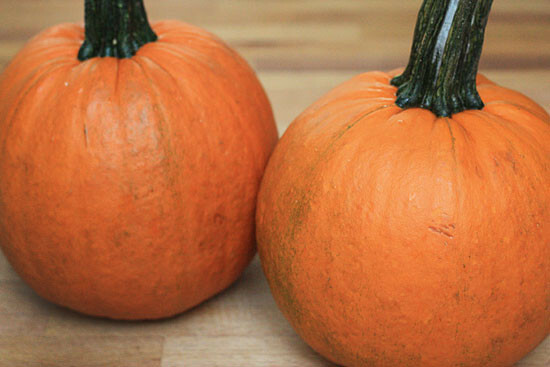 Using a heavy, sharp knife, cut the pumpkins in half. Scoop out seeds and place on a baking sheet; bake for 1 – 1-1/2 hours. 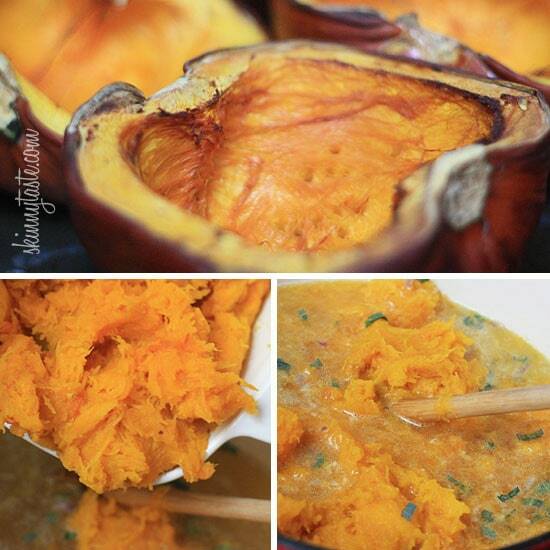 When the pumpkin is cooked and cool enough to handle, use a spoon to scoop out the flesh. This should make about 5 cups. Add butter to a large pot or Dutch oven, on medium heat; add shallots and sauté until tender, about 4 minutes. Add pumpkin and broth to the pot, along with sage, salt and pepper and bring to a boil. Simmer, covered for about 15 minutes. 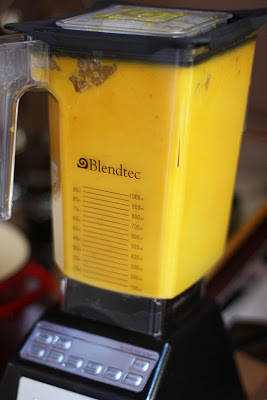 Blend in a blender or immersion blender and blend the soup until smooth. (Optional) Garnish with light sour cream and sage.